Hey everyone! BOY do I have something exciting to announce!! After a super fun CAL with Furls Crochet back in October 2017 and a few months of craziness, I am FINALLY able to get this beautiful Evangeline Cardigan crochet pattern up and listed for you all! This design is one of my all time favorites I’ve done, and I sure hope you all enjoy it as well! Using one of my favorite fibers from We Are Knitters, the body and sleeves are created with their super soft and luxurious Meriwool in the color Natural. As for the cuffs and detailing on the pockets, edging and back, I used the We Are Knitters Petite Wool in color Pearl Gray (one of my favorite colors they offer!). I had so much fun playing around with different stitches to really make this design special. The back ruffle detail is so fun and really allows this piece to be unique and playful. 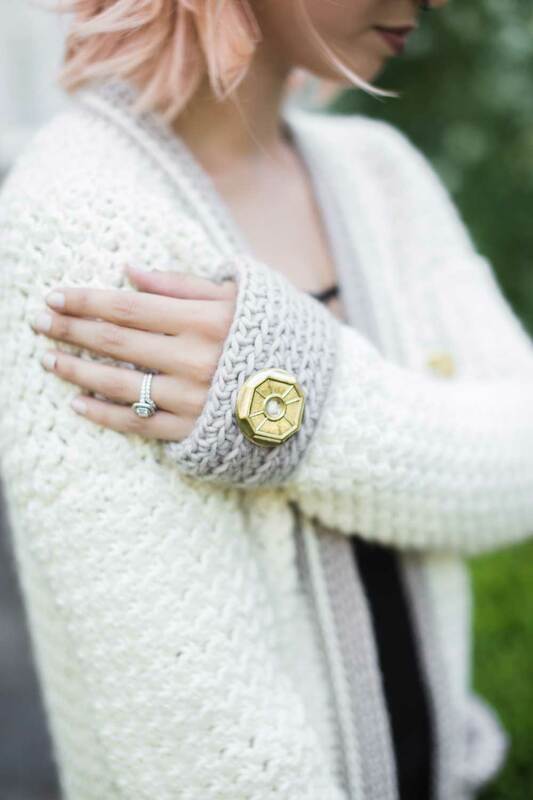 Not only did I use super yummy yarn, but I also had the opportunity to work with Button Avenue to include these gorgeous golden, oversized buttons. Though I didn’t use them to be functional, I felt they offered a wonderful aesthetic against the fibers and the gold just really paired well with the yarn colors! What do you think? If you’d like to snag a beautiful templated (custom designed by @debrosse_nyc!) and printer-friendly PDF version, please feel free to purchase your copy on Ravelry, Etsy or Love Crochet! Evangeline Cardigan is the perfect garment project for those wanting to end up with something deliciously cozy, fun to make and want to be by others where they "bought" it. ;) Down the length of the back panel, I included two fun stripes of contrasting ruffle stripes to give the usually "boring" part of the garment a surprising detail that not only breaks up the monotonous stitches, but also gives a great personality factor.